A man who police say has a history of drunken driving arrests rammed his car into a crowd of pedestrians in New York City’s busy Times Square early Thursday, killing one person and injuring 22 others before being taken into custody. 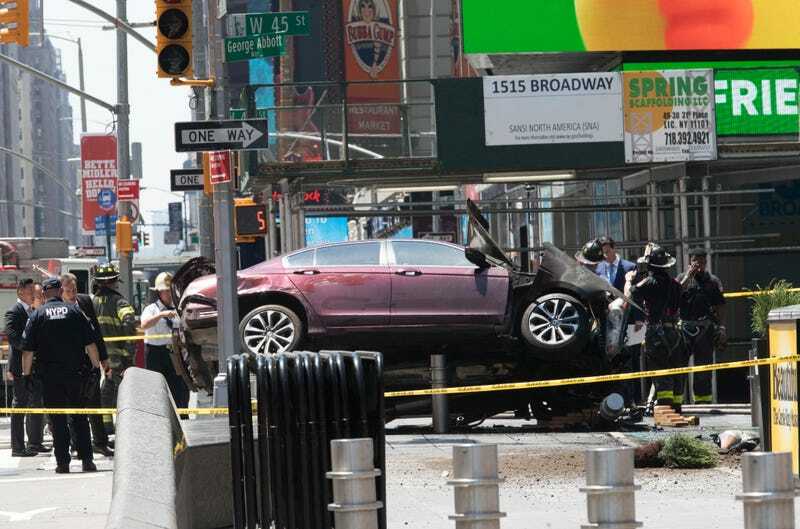 The maroon Honda that 26-year-old Richard Rojas was driving came to a stop after crashing into stanchions at 45th Street and Broadway, the New York Times reports, and Rojas was tackled by a traffic agent and taken into custody as he fled the vehicle. Law-enforcement officials said that they had determined that terrorism did not have a role in Rojas’ actions. Officials said that the deadly rampage had begun around noon near 42nd Street, when Mr. Rojas, traveling south on Seventh Avenue, inexplicably made a quick U-turn, mounted a curb on the west side of the one-way avenue and began to drive north against traffic. Witnesses described their horror at seeing a car race through the area, which was thronged with tourists, workers and otherpassers-by on a sultry afternoon. An 18-year-old woman was walking with her 13-year-old sister between 42nd and 43rd streets when she was struck and killed, the Times reports. Her sister was also injured, but neither victim has been identified. Fire Commissioner Daniel P. Nigro said that four other people were critically injured and sustained multiple fractures and traumas. Three other people were taken to hospitals in serious condition; the remaining victims had less serious injuries. As of Thursday afternoon, Rojas, a Bronx resident and Navy veteran, had not been formally charged, the Times reports, but he was previously arrested twice for drunken driving: once in Queens in 2008, and in Manhattan in 2015. In addition, he was recently arrested for menacing.